This is a story of old ships, childhood summers, inline-8 diesels and a four-letter word. This is the story of the 52-year-old M/S Amur, a vaguely abandoned 282-ft passenger riverboat. Without this rusty old Danube cruiser, I would not be here. In the early ’60s, when my father was studying to become one of Hungary’s first geneticists, he was also making wild kayak trips on the Danube. The fates of hydrology and Cold War politics marked the southernmost point of his journeys in Gemenc, an ancient tidal forest on the western bank of the river a few miles north of the then-Yugoslav border. It was love at first sight. It’s not hard to see why. Gemenc is a fairy tale forest of oaks, stags, oxbow lakes, black storks and backwaters, a proper wilderness where the Danube is flat and wide, and death’s-head hawkmoths and hornets buzz outdoor lights. He bought a summer house with the forest for a backyard and I spent every summer of my childhood there. We fed fish and watermelon rinds to the wild boars which came right up to the house. There were boats. Black cargo boats which carried coal and ore, white passenger boats which trained high-power beams on the shores at night and we waved at their passengers, rare and treasured hydrofoil boats which moved at impossible speeds. We had our own boat—the only way to reach Gemenc without a 4×4 or a horse—made of oak boards and powered by a 4 hp Johnson outboard engine, quite the thing in then-Communist Hungary. The boats had names. I didn’t know because I couldn’t read. But that changed. The letters were big. My parents deciphered them. Never the Cyrillic, only the Latin. I wouldn’t learn how to read Cyrillic until I was 24. But it was a different matter with the Latin letters. By the time I entered first grade, I was a fluent reader. I never stopped. It was the boats. And M/S Amur was my favorite. She was outdated even back then. A chunky, blocky thing compared to her sleek successors like M/S Sofia, M/S Ukraina and M/S Volga, Amur had the hydrodynamic beauty of a cinder block and she produced big waves, tall, violent waves incongruous on the serene water. I loved her. Amur was my special treat. 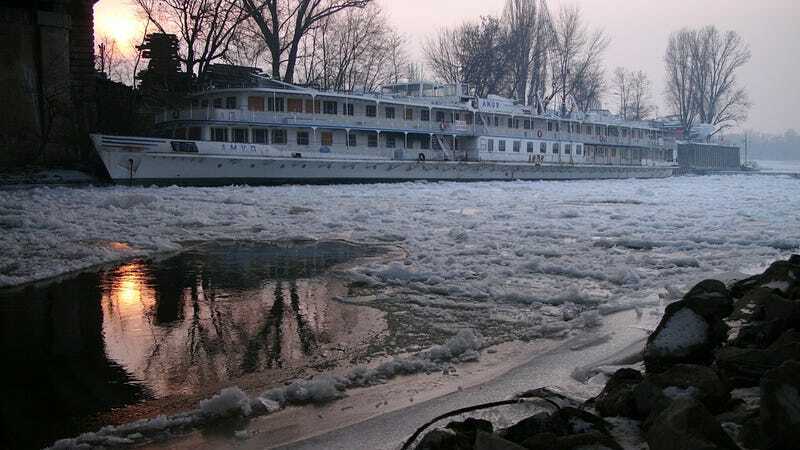 Slowly, she was phased out of regular service along with her sister ship M/S Dunaj and then our yearly month-long forest retreats came to an end too. So it was quite a shock to see Amur again, like running into someone you’d last seen in grade school. Back when I was a kid in Speedos grinning at the mad waves of Amur, there was no internet and I knew nothing about her. I know a lot about her now. She was built in 1960 in Austria and is registered in Ukraine. She’s 282 feet long, can take on 212 passengers and is serviced by a crew of 56. She is powered by two inline-8 Deutz RBV8M 545 diesels, good for 600 hp each. The engines are monstrous. I wonder how I would have reacted to my future self back in the late ’80s if he’d told me that 20+ years later there would be an invention called the internet and layered on this invention would be another invention called YouTube and on this YouTube I would be able to watch and listen to the mighty Deutzes of Amur. You can, too. Amur is now for sale by Wiking Yacht Club, a Hungarian shipping company, for $415,000. I know next to nothing about the riverboat business but it seems as wild a price as Amur’s waves were in her heyday. She’s parked off the side of Wiking’s Budapest facilities, slightly out of sight of the powerboats Wiking services, and last fall, the water was so low that she listed heavily to port, her starboard side caught on the embankment. The water is now back up, slightly, and Amur has righted herself. On the early morning I visited her, she was enveloped in a wide ring of ice floes. The current was not strong enought to move them. It was very cold. People were commuting to work across the bridge above, but down below, there was nothing but gulls and Amur and the tingle of ice. No Hummers were in sight. I have dreams of buying her. Of rebuilding her to a standard impossible to imagine around the time she was prowling the lower Danube. It’s an impossible dream. I watched the sun come up behind her bridge, turned off my camera and climbed up some stairs, smiling, my fingers numb.